This beautiful boy is Hanson. 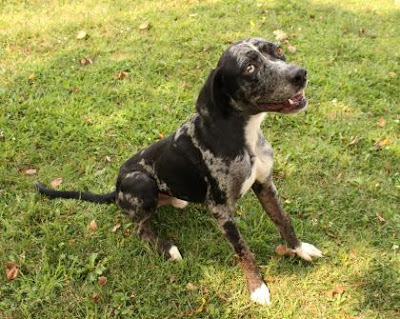 He's a 4 year old Mississippi born Catahoula Leopard Dog mix. Hanson really is a striking dog with one blue eye, one brown eye and a beautiful black, gray and white fur coat. Hi there, my name is Hanson....that's spelled H-A-N-D-S-O-M-E. Just a little joke, but I am a very good looking guy. I'm a 4 year old Catahoula Leopard Dog mix, and my coat is just the right combination of black, gray and white. You probably can't see it in my photo, but my eyes are unique. One is brown and one is a striking blue, which is handy when I want to flirt! I was transferred to Wayside from the Humane Society of South Mississippi. I'm a little underweight right now and that's probably because of being nervous and not having a loving family to make sure I stayed healthy. The good people here are feeding me all kinds of yummy things now, and making sure I'm as healthy as can be. I'm sure I'll get back in shape quickly. I feel so much better now that I'm here, and sure hope I'll find my forever home soon. I hope I can convince you to come and meet me, because I know you'd be impressed with how loveable and smart I am. I will sit on command, and I take treats very nicely. I am well-mannered (except around squirrels...they drive me crazy) and just SO interested in all there is to see on my walks. I mean, I want to explore and sniff just about everything! I need to make up for all those days when I didn't have a loving human to show me around. I'll do best if walked with a harness since all my enthusiasm makes me pull on the leash a bit. In my new home (which I hope is yours!) I would love to learn more basic commands and doggie obedience skills. I'm motivated by praise and food, so I should learn quickly. I would love to play games with you that would stimulate me mentally and entertain both of us! Bragging is really not my thing, but some people here say I'm "beautiful" and my eyes are "enchanting!" I think you should come out and see for yourself...that would really make me happy. When you come to meet me, please bring all the members of your family and any furry members too...just to make sure we all get along. I can't wait to meet you and I know you won't be disappointed. Just ask for me, Handsome Hanson! And please come soon! On Sunday, September 20, join Wayside Waifs for the 25th Annual Strutt With Your Mutt 5K Race & 3K Walk for homeless pets in beautiful Brookside. Your support makes a difference in the lives of abandoned, abused and homeless animals. YOU ensure they get a second chance at the life they deserve. Strutt With Your Mutt is a true celebration of the profound bond between animals and people. As their largest fall fundraiser, this is one event that makes a difference in the lives of animals and people in the Kansas City community. Sharing! Hope you find your forever home soon! Gorgeous pup! Will share! 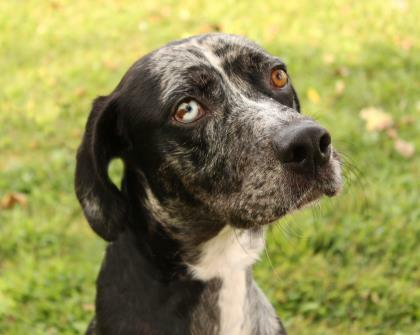 We had a Catahoula at the shelter where I volunteer once - fun dogs! Hanson is such a cutie but he sure looks so sad. We hope his happy shows up to take him home soon. We will share. p.s. thanks for the info. I only get a chance to update the link around 5am before my day starts, otherwise I'm on mobile the rest of the day and can't update my blog. No worries. Thanks for sharing Hanson! He is beautiful! 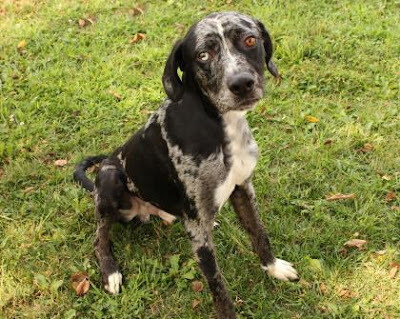 My son just got a Catahoula. They are gorgeous dogs. Sure hope Hanson finds a home soon. Sharing.